Updated October 2017. People think we’re crazy when we tell them we spent a month in Vietnam without doing a Halong Bay cruise. Sometimes I can’t believe it myself – I mean it is at the top of most Vietnam to do lists. 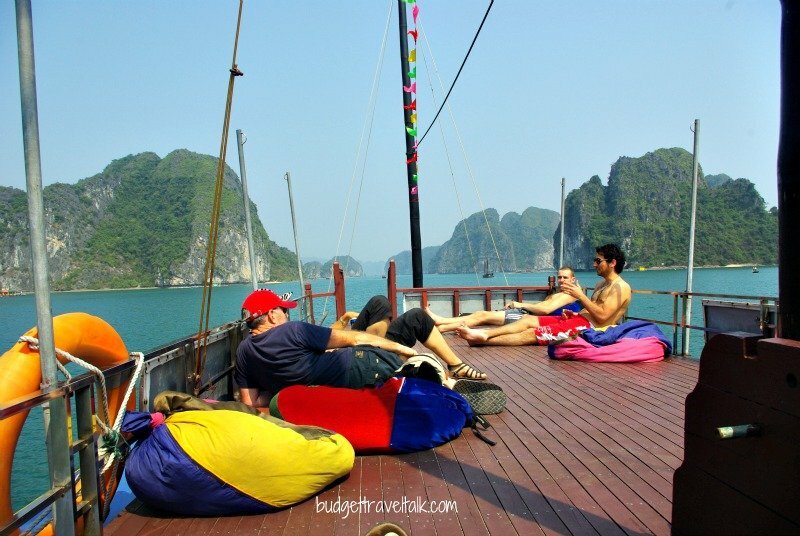 But then I relax and remember – we chose Lan Ha Bay over Halong Bay and loved it. We didn’t miss out on Halong Bay, instead we saw what we believe to be a better version of it. From all accounts, Lan Ha Bay Vietnam has less boats and pollution plus Cat Ba island has beaches, caves and restaurants to explore between trips out into the limestone green waters of the bay. Why choose Lan Ha Bay? 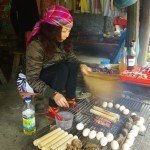 Hanoi to Cat Ba Lan Ha Bay – via Haiphong – Do It Yourself Option. Hanoi – Hoang Long Bus Company. 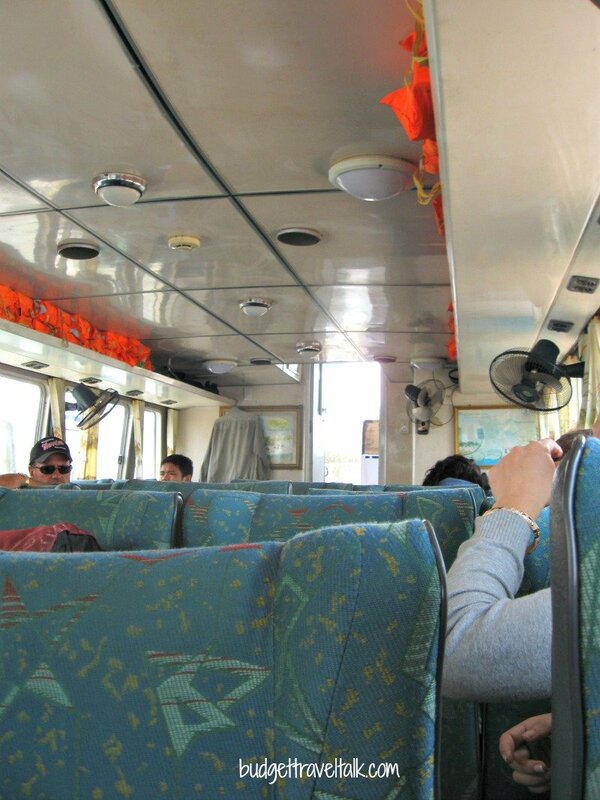 Getting to Cat Ba Island from Haiphong. Good Morning Cat Ba Option. More Cat Ba Island Things to Do. Halong Bay is polluted and crowded with boats as far as the eye can see. 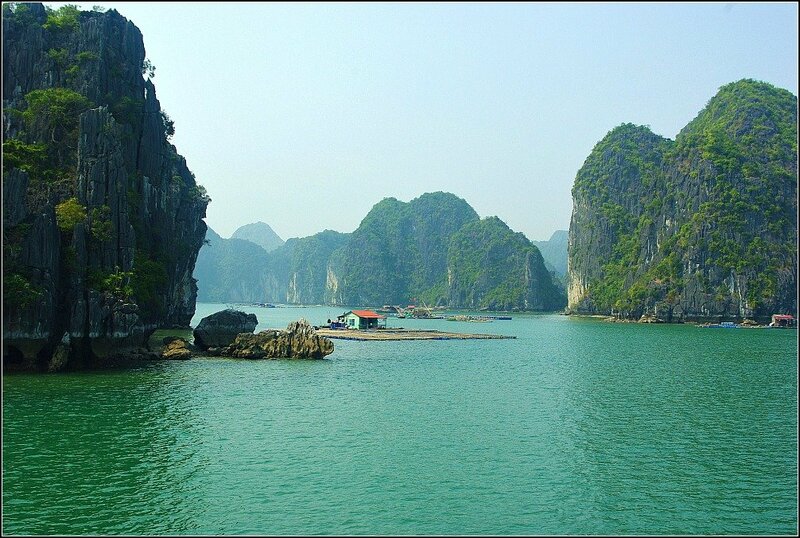 Lan Ha Bay is at the southern end of Halong Bay – well away from the boat crush to the north. 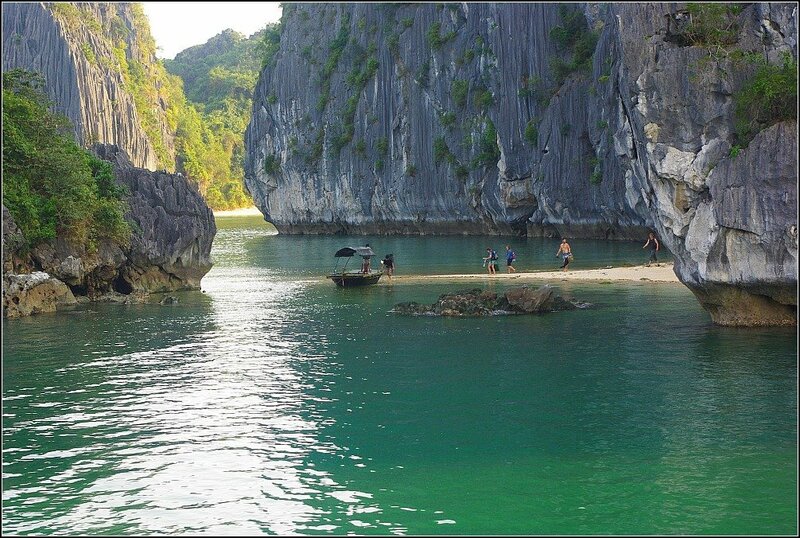 It has the same karst limestone outcrops and in addition, it even has white sandy beaches. Hanoi to Halong Bay trips via Halong City are mostly mini-bus/Halong/mini-bus back to Hanoi. Only a small amount of luggage is allowed – the rest being left behind in Hanoi. These buses are notorious for stopping at tourist shops along the way. We wanted to continue on to Ninh Binh after the boat trip and not back-track to Hanoi, so we needed to bring all of our luggage with us. Hoang Long Bus Company had a service leaving from Cat Ba City to Ninh Binh our next destination. Everything fell into place – we decided to visit Lan Ha Bay instead of Halong Bay. After scouring the internet for alternatives we found Slo Pony who have since changed their name to Asia Outdoors. This outdoor adventure company, which offers Lan Ha Bay Tours from Cat Ba Island, encourages independent travellers to bypass Halong City and go directly to Cat Ba Island. On offer are experiences ranging from SUP and Yoga Retreats, to Rock Climbing and Trekking. We chose the One Day Kayaking/Climbing Boat Tour. There are 300 karst limestone islands in the Bay south and east of Cat Ba Town. Asia Outdoors made the trip from Hanoi to Cat Ba SO EASY. They have intricate knowledge of how to get to Cat Ba Island and now offer an all inclusive Hotel to Hotel service for $16 USD (Good Morning Cat Ba). You can read about both the Do It Yourself version we did and the Good Morning Cat Ba Island all inclusive deal here. I guess you are wondering how to get to Lan Ha Bay! Well we followed instructions from the website for how to get from Hanoi to Lan Ha Bay, which worked perfectly for us. We purchased tickets on the day of departure at the bus station, but it is possible now to book them on line. Hoang Long Bus Company is a public bus service. On arrival at Haiphong, the Cat Ba contingent of passengers, transferred to a smaller bus before being dropped at a Hoang Long ticket office in a dusty commercial area on the outskirts of Haiphong. Although puzzled as to why we were there, the atmosphere was relaxed and it was possible to purchase food and drinks from passing vendors. Afterward it became apparent that the stop was made to tie in with the arrival of the boat. When the time was right we re-boarded the bus and were driven to the jetty. The Boat from Haiphong to Cat Ba Island. Described as a speed boat, I was relieved to find ours was a decently sized passenger boat. The waters between the mainland jetty and Cat Ba Island were sheltered and calm, making travel sickness a non-event. Half an hour later we arrived at the deserted Cai Vieng Harbour where another mini-bus made a zippy cross country ride into Cat Ba town. This option has obviously come into being to make the trip easier. It is a little more expensive than the do it yourself version, but on the plus side, it picks up from your Hanoi hotel and smooths out the hassle of transfers. As far as I can tell it is not a public bus service. Not being able to speak Vietnamese can make the Do It Yourself version a little more challenging, but it is cheaper and probably more stressful/exciting. Both options take the same amount of time – 4.5 hours. Cat Ba town is more interesting and enjoyable, than beautiful. Concrete hotels, four or more stories high, stand like soldiers along the Esplanade, the randomly painted ones bringing a tiny taste of Italy to the scene. The atmosphere is endearingly gung-ho, with pushy pearl vendors shouting their cut-throat sales pitches, while pedestrians try not to break a leg on the uneven pavements. At night, the dull daytime Esplanade evolves into a bright and busy neon-land and everyone comes out to play. We found Cat Ba to be quiet during the week but noisy and congested with local tourists on the week-end. Our boat tour was a combined climbing/kayaking trip, but now the two are separate. At 8.45 a.m. we boarded the mini bus to Ben Beo harbour about 2 km from town. Guide Jo, a friendly young American woman, mixed effortlessly, entertaining us with stories from her nine month stint teaching English in Hanoi. Initially unsure of our Lan Ha Bay choice, it soon became obvious that it was equally, if not more, naturally beautiful than Halong Bay. 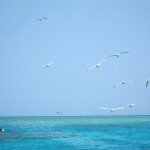 In places it abounded with small local fishing craft and water villages, while in others it was just us, the islands and the gorgeous green limestone tinged water. When the climbers and guide were dropped off at an island, the captain took the remaining eight passengers to a good kayaking area. I liked that the kayakers were not treated as an after-thought. We paddled together through a rock opening into a peaceful lagoon, then back through the floating fishing villages, and briefly out into the open ocean. With the climbers back on board, the boat moors for lunch. The crew prepares sautéed potatoes, fried chicken, spring rolls, rice, tofu and omelette with individual (and correct) tabs kept for beer, soft-drink and bottled water. Groups of four gather at individual cane tables on the lower deck, sharing the plentiful communal platters. Both boat trips we experienced in Vietnam had excellent food and how the crew managed to prepare it with little more than a gas burner and a piece of deck space is beyond me. With the climbers dropped at their next location, we cruised to a new kayaking spot with a mini island temple and free kayak time in the maze of islands. This time everything was more relaxed with some kayakers choosing to stay on deck while others explored the temple and islands. Lounging in bean bags on the top deck, drinking beers, swapping stories and watching the sun drop behind the islands as we cruised back to port was a beautiful way to end the day. Previous rock climbing experience is not necessary and the guide instructs as you climb. It was possible to mix it up with kayaking one half of the day and climbing the other. One passenger switched to kayaking after completing her first climb as she found it so physically challenging. On the way back to port we dropped some guests off for a romantic night at an island resort, and others at the Hanoi Beach backpacker island, which was all pumping music, beach volleyball and partying. We were so happy with our trip into Lan Ha Bay. The scenery was out of this world – gigantic limestone pinnacles jutting skyward from the emerald green water – sandy beaches clinging to their bases – colourful floating villages – plenty of time and space to explore wherever we wanted – great food – good conversation. It was one of those magic travel days to think about years later and a great way to cruise Lan Ha bay. Please Note: Check which trips are available currently on the Asia Outdoors website. On arrival we quickly chose a hotel so that we could organize a trip to the war-time hospital cave that very afternoon. In the side street near Noble House we walked into a shop with a tourist information sign out front, and negotiated the hire of two motorbikes with driver/guides. Taxis were also available at twice the price, which was still inexpensive. I’m not a motorbike rider but it was an exciting 10 km ride, up and down hills, along bays and beside green cultivated fields. My pint sized driver spent his time nonchalantly on his phone, while I clung somewhat nervously behind. Whenever we went downhill I found I slid toward him on the highly polished seat. Awkward! I did love the breeze and sense of freedom and could easily become addicted. On arrival at the cave our drivers played pool at a nearby cafe while a guide led us up bamboo steps to the cave entrance. Just inside the cave he produced a fake machine gun (joke) before beginning his tour. With the machine gun prop disposed of we visited the operating theatres, movie theatre, bedrooms, kitchens and the escape route where soldiers could jump from a high up cave into a pool on the lowest level. The cave had three floors of rooms built into it and was in use until 1975. Who knew such a thing existed? On the way home, after yet another phone-call, we made an impromptu detour to collect my driver’s child from school. Thankfully she had already left with a relative, although to be one of three-up on a bike would have been an experience. Seafood is the speciality on Cat Ba. Restaurant tanks of live crabs and fish are common. We tried several places along the Esplanade Strip. The Bamboo Hut, Huong Y, the Noble House Cafe (Western/Vietnamese mix), Green Mango (breakfasts) and last but not least the restaurant (name unknown) on the left of Bamboo Hut. There, we watched the cook prepare superb fresh crab and prawn spring rolls for us, after which he whipped up stir fried squid and vegetables. The squid was fresh, sweet and tender and is still the best I’ve tasted and I eat a lot of squid. Restaurant food was only a few dollars but even cheaper food could be found at the markets on the way into town. There were floating restaurants, accessed by boat from the main pier just near the welcome sign, but we were happy with the quality and price of those on shore. Call me paranoid, but I didn’t fancy being on a floating restaurant, reliant on another’s goodwill to get us back to shore. Our first waterfront hotel had huge rooms but a neglected feel, with curtains falling from their hooks, and drain water that flowed from the claw foot bath, across the floor in front of the toilet before finally finding it’s way to the drain hole in the far corner of the room. I think there may have been one other couple staying at the hotel, which I suspect would lift it’s game come peak tourist season. Our room had a great view of the bay. The second night we spent at Noble House, which was clean and well-maintained with the same great view, but noisy from the music in the bar. We knew this would be the case and had ear plugs ready for action. There are many accommodation bargains to be had on the island especially out of season. 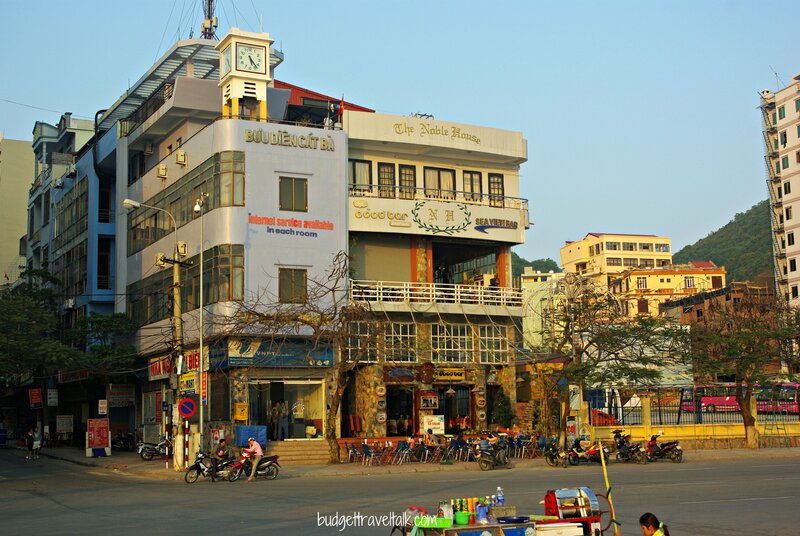 Budget Option: Trang Anh Seaview Hotel. 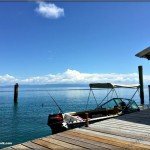 $18 USD for two nights in November. Noble House is on the Cat Ba waterfront. We recommend the Lan Ha Bay experience. 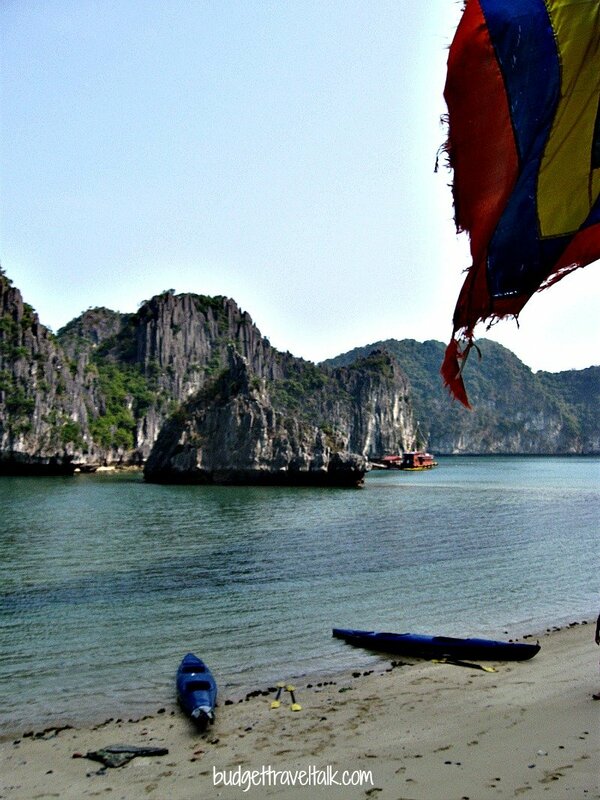 It worked well with our ongoing travel plans and was a low-key and budget friendly alternative to Halong Bay. 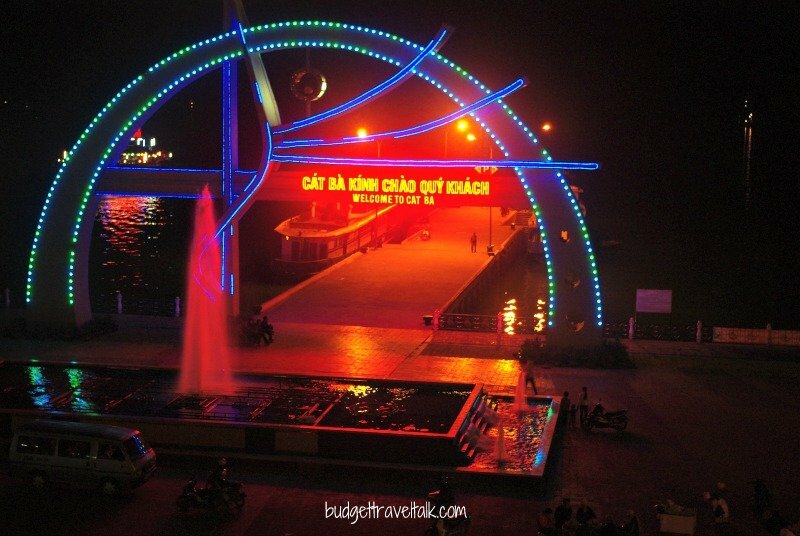 When we were planning this portion of our Vietnam trip it was difficult to find information on Hanoi/Cat Ba/Ninh Binh. We hope that this post fills that gap. It doesn’t have great shopping – except for pearls. We have no association with Asia Outdoors and have not been paid or received any compensation for this post. 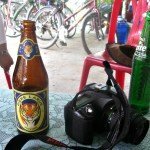 Read more One Month in Vietnam posts. Read more posts about Asia. Sounds as though it was a good decision to go to Lan Ha Bay instead of Halong Bay. What a beautiful day you had. For anyone wanting to do the same trip, your details of how to get there and what to do are fabulous. Stunning photos and great information – thanks for this one! Wow- that one photo of the people walking on the water (it looks like that) is incredible and makes me want to jump on a flight right now! Thanks for the comment Jade. Are you talking about the climbers walking back to their boat? Too bad about the accommodations. It’s the one thing I always worry about when I travel — having a clean and comfortable place to rest. The views are quite spectacular – I’m sure you’re glad you chose La Ha Bay. Such beautiful scenery. Thanks for taking us along on your trip and providing such details. It looked like a wonderful choice. I’ve been to Vietnam 3x but never made it to the north. I will definitely bookmark this, as I have no idea where to go there. Wonderful photos! It’s amazing what you can accomplish with a little research. 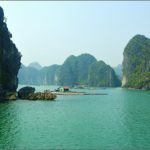 I did kayak in Halong Bay – in January during a really cold spell but I think your alternative sounds particularly lovely – well except for the $10 hotel. Thanks for that great info. Haven’t been to Vietnam yet, so I’m interested in seeing everything and everywhere. Your landscapes are stunning here. 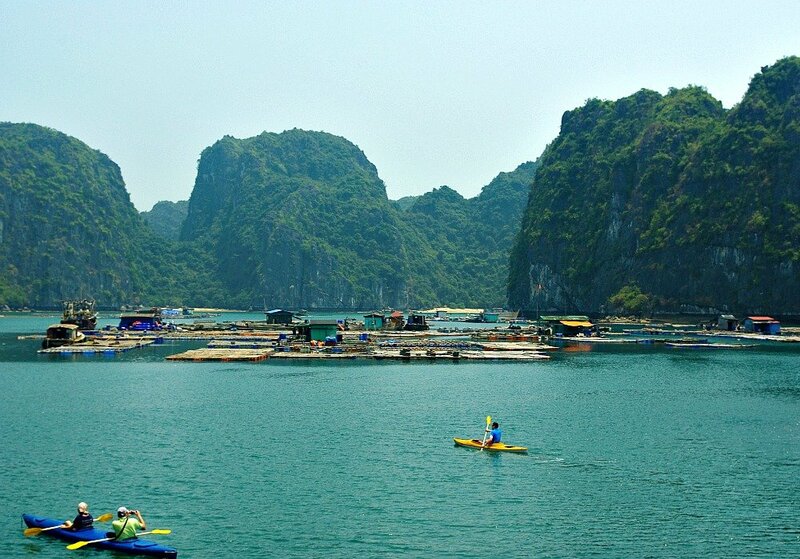 Sounds like an awesome experience – have “done” Ha Long, but will def. check out this option next time I’m in Vietnam! would you recall any information about ” romantic night at a low key island resort”- like islands name or the resorts name? Hi Helena, I can’t remember the name of the Island. If you use the contact form at the bottom of http://www.asiaoutdoors.com.vn/News/Adventures-we-offer/Boat-Trips-and-Kayaking.html you could ask them for suggestions as they dropped the people off on the island on the return trip. Thanks for asking for help and get back to me if you want to know something further. This looks amazing Jan and so un-touristy! You are adventurous … we’ve lost it a bit, but you give me hope that it will return 🙂 and having advice like yours really helps. Jo, you are very generous. I think you have much more get up and go than me! Your life is so action packed! 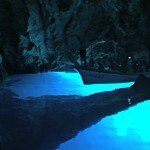 I had never heard Ha Lan Bay or Cat Ba so I was very interested to read this post. We did the Ha Long Bay cruise and although we loved it we did think it was a little too overcrowded on the water and in some parts a little polluted. My husband swam but I wasn’t brave enough. I would say that Ha Lan Bay looks fairly similar from your photos. Hi Kathy. 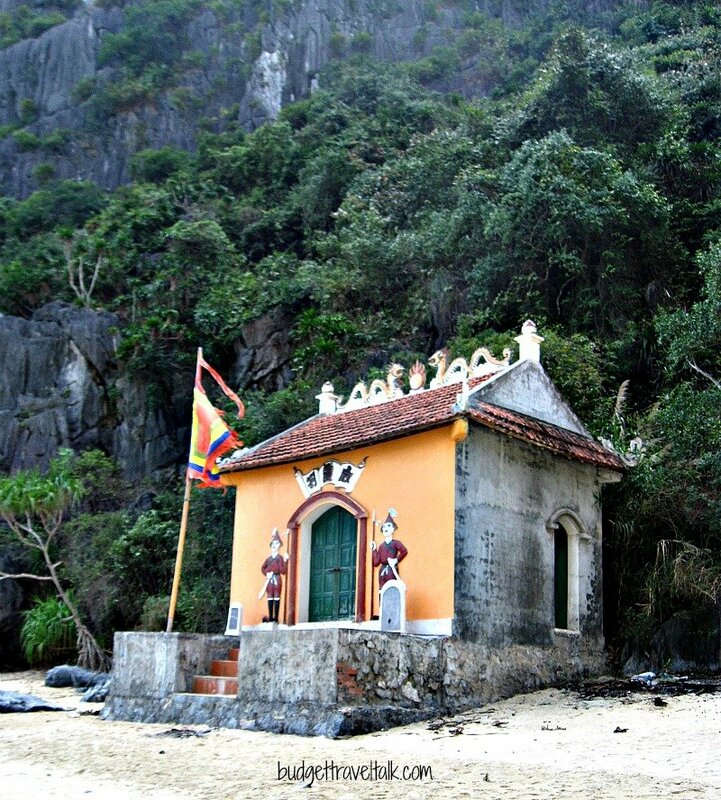 Some Halong Bay Cruises stop at Cat Ba. My nephew used a HB cruise and jumped ship at Cat Ba then found his own way forward. I wouldn’t swim in Halong Bay and it was too cold to swim when we were in Lan Ha Bay. 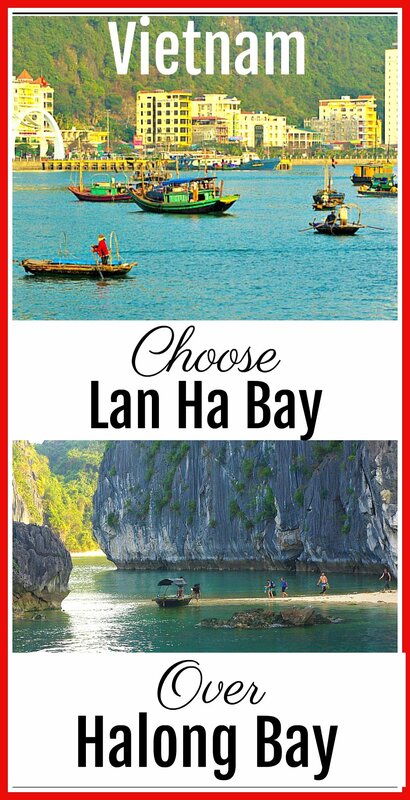 Thank you for this post – it’s been really helpful in convincing us to go to Lan Ha Bay instead of Halong Bay? Do you think it’s better to do an overnight cruise around the bay or just a day trip? 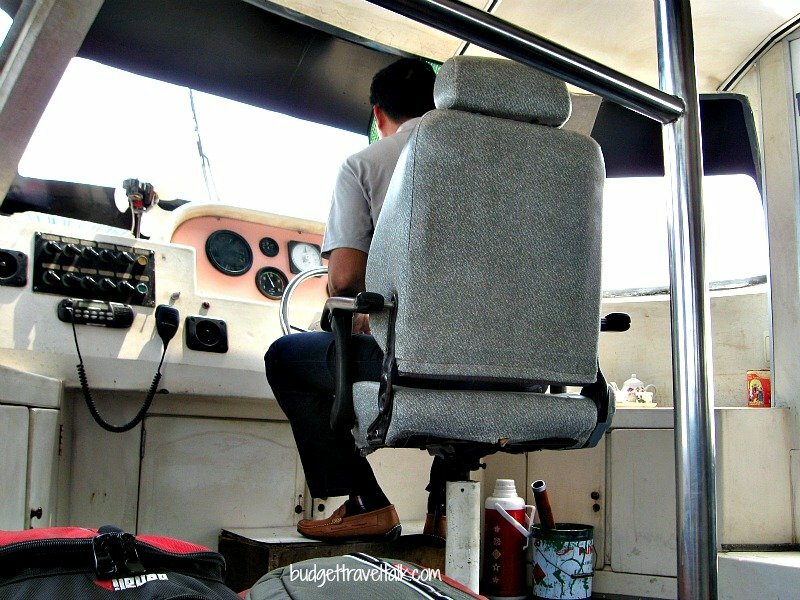 We are going with Cat Ba Ventures, so if we do a day trip we’ll have about seven hours (10am-5pm) on the bay. Is this enough time? That is a toughie Matt. We initially wanted to stay overnight in the bay, but the price was dependent on how many people went and no-one else wanted to. Instead we did a one day and were very happy with that. We thought we had seen enough and didn’t go back for another day. Having said that it would be nice to experience an overnighter although I personally wouldn’t like to sleep below decks. I think if you were on the boat overnight it would be so easy to just keep on exploring the bay. Either would be great in my opinion. If you’re short on time one day would be plenty. Another thing to consider is if you want to climb or not. An overnight might work well if you wanted to combine some different activities. (We just kayaked). I’m not familiar with Cat Ba Ventures but I hope I’ve been helpful.